ELI-viscero-24 Test (preclinical detection, full panel) – Assessment of different human body organs functional state based on 24 antibodies. ELI-P-complex Test – Assessment of woman's body and reproductive functional state based on 12 antibodies. ELI-Vaccino-Test – Child health assessment before vaccination based on 6 antibodies. ELI-ANCOR-Test – Assessment of cardiovascular system functional state based on 12 antibodies. What are ELI-tests extras comparing to standard medical tests you can find here. 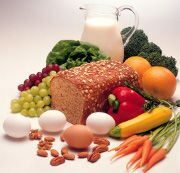 Individual diagnostic test for food intolerance.